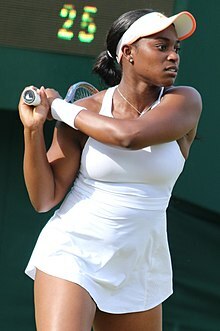 Sloane Stephens (born March 20, 1993) is an American professional tennis player. She is ranked in the top 10 by the Women's Tennis Association (WTA), and achieved a career-best ranking of No. 3 in the world in the summer of 2018. Stephens was the 2017 US Open champion, and has won six WTA singles titles in total. Last updated on: March 25, 2019. Born to athletic parents with backgrounds in collegiate swimming and professional American football, Stephens was first introduced to tennis at the club across the street from her house in Fresno, California. Her stepfather was a competitive recreational tennis player and served as her primary inspiration for beginning to play the sport. Stephens moved to Florida to train at a tennis academy, ultimately working with Nick Saviano for many years. She developed into a promising junior player, reaching a career-high ITF junior ranking of world No. 5 and winning three out of four Grand Slam girls' doubles titles in 2010 alongside her partner Tímea Babos. While still just 19 years old, Stephens rose to prominence at the 2013 Australian Open with a semifinal run highlighted by an upset of then-world No. 3 Serena Williams. Although she climbed to as high as No. 11 towards the end of that year, she later regressed and stayed steadily ranked outside the top 25 through the end of 2015. At this point, Stephens switched to a new coach, Kamau Murray, under whom she returned to an elite level and won three WTA titles in the first half of 2016. Her successful year was then cut short by a foot injury that kept her sidelined for eleven months. She returned from injury in the middle of 2017 and won her first Grand Slam singles title at the US Open in just her fifth tournament back. She was also awarded WTA Comeback Player of the Year for her successful season. In 2018, Stephens continued her success by winning her first Premier Mandatory title at the Miami Open, reaching a second Grand Slam singles final at the French Open, entering the top 10 for the first time, and finishing runner-up at the WTA Finals. Stephens was born on March 20, 1993 in Plantation, Florida to Sybil Smith and John Stephens, both of whom were accomplished athletes. Her mother was the first African-American woman to be named a first-team All-American swimmer in Division I history. She is enshrined in the Boston University Athletic Hall of Fame and recognized as the greatest swimmer in the history of the university. Stephens's father was a Pro Bowl running back for the New England Patriots in the National Football League. Pro Football Hall of Famer Raymond Berry regarded him as the best athlete he had ever seen. Smith left Stephens's father when she was a baby after his multiple arrests in 1994. She was raised by her mother and her stepfather, Sheldon Farrell, who married Smith in 1997 and worked as a business consultant. She has a younger half-brother, Shawn Farrell, who played baseball and football at Notre Dame High School outside of Los Angeles. Stephens did not talk with her biological father until she was 13 years old, when he expressed interest in getting to know her after being diagnosed with degenerative bone disease. Even though they only met a few times in person, the two of them developed a close relationship remotely. Stephens's stepfather passed away from cancer in 2007, while her biological father died in a car crash in 2009. Stephens moved to her mother's hometown of Fresno in California at the age of two. She started playing tennis at the age of nine at the Sierra Sport and Racquet Club, a tennis facility located across the street from her house where her stepfather regularly played and her mother was taking lessons. Former professional Francisco González, the head tennis pro at the club, recognized Stephens had impressive ability given her limited experience and recommended her to pursue more rigorous training opportunities. Two years after she started playing tennis, Stephens relocated to Boca Raton in Florida. She began training at the Evert Tennis Academy founded by John Evert and also run by his sister, International Tennis Hall of Famer Chris Evert. The following year at age 12, Stephens switched to the Nick Saviano High Performance Tennis Academy, and also began online homeschooling. After her stepfather's death, Stephens and her family moved back to their hometown of Fresno where her grandparents and other members of her mother's family still lived. From then on, she split time living in both California and Florida. Stephens began competing in low-level events on the ITF Junior Circuit in 2006 at the age of 13. Her first breakthrough result came at the US Open in 2008, where she reached her first doubles final at a Grand Slam with Mallory Burdette. She then finished the year with a semifinal appearance at the high-level Orange Bowl tournament, a Grade A event. Stephens began 2009 by winning her first two tournaments of the year, the Grade 1 USTA International Spring Championships and the Grade A Italian Open. Following these big titles, she only played in the remaining junior Grand Slam events in 2009 and 2010, while also skipping the Australian Open. At the French Open, Stephens extended her main-draw win streak to 16 matches in a row to start the season, despite needing to qualify for the main draw, before losing to French junior Kristina Mladenovic in the semifinals. Mladenovic ended up winning the tournament, and would also defeat Stephens in their next encounter at the Wimbledon quarterfinals. These results brought her to a career-high junior ranking of No. 5 in the world. During the US Open, she left New York after her first match to attend her biological father's funeral in Louisiana. She returned to play and win her next match, but ultimately lost in the third round. In 2010, Stephens partnered with Tímea Babos to win the doubles title at all three majors in which they participated. They became just the second pair of girls to win three Grand Slam tournament doubles titles in one season after Corina Morariu and Ludmila Varmužová in 1995. Stephens also reached at least the quarterfinals in each of the singles events. Her best singles result that year was a Grand Slam semifinal at the US Open, where she lost to Daria Gavrilova in a third set tiebreak. Stephens played her first professional events on the ITF Women's Circuit in late 2007. In the spring of 2008, she received a qualifying wild card into her first WTA event, the Miami Open, where she lost her opening round match. She would lose in qualifying the next two years as well. Stephens also received wild cards into the US Open qualifying rounds for three consecutive years. In her first appearance in 2008, she defeated world No. 109 Melinda Czink while still only 15 years old, but was unable to advance to the main draw in any of these appearances. During the summer of 2008, Stephens won her first professional title in doubles at a low-level ITF $10K event in Wichita alongside partner Christina McHale. In the middle of 2009, Stephens participated in World TeamTennis as a member of the New York Buzz. Although she seldom played on the pro tour that year, Stephens decided to turn pro in October following a strong junior season. In March 2010, Stephens qualified for the Indian Wells Open to make her WTA debut a week before turning 17. She defeated Lucie Hradecká in her first career main draw match before losing to the defending champion, 12th-seeded Vera Zvonareva. Her only other WTA tour win that year came at the Swedish Open in July. After starting the year ranked No. 802, she finished the 2010 season just inside the top 200 at No. 198. Stephens continued to climb the WTA rankings during the 2011 clay court season. She won her first professional singles title at the Camparini Gioielli Cup, an ITF $50K event in Italy. She then made it through qualifying at the French Open to make her Grand Slam main draw debut in singles. Although she lost to Elena Baltacha, she rose to a career best No. 128 in the world. In August, Stephens entered the Southern California Open as a wild card and defeated No. 20 Julia Görges en route to her first WTA quarterfinal. Later that month, she was awarded a wildcard into her first US Open main draw. In the opening round, she defeated Réka Luca Jani for her first Grand Slam tournament match win. She then backed up that win by beating 23rd seed Shahar Pe'er. With this third round appearance, Stephens made her debut in the top 100 of the WTA rankings and also became the youngest player in the top 100 at 18 years old. With an improved ranking, Stephens was able to play WTA Tour-level events the entire season. Early in the year, she played in her first Australian Open main draw and made it to the second round. Stephens then closed out the winter hard court season by qualifying for the Miami Open. Having played there every year since 2008, she picked up her first two main draw wins at the tournament, including the second one over No. 30 Sara Errani. In late April, Stephens made her Fed Cup debut in an away playoff tie against Ukraine. She won her only match, a doubles dead rubber with partner Liezel Huber, as the United States won the tie 5–0 to return to the top-level World Group in 2013. After early losses at her first few clay court events of the year, Stephens finished this part of the season with three impressive results. First, she qualified for the Italian Open Premier 5 tournament and advanced to the second round. She then reached her first WTA semifinal at the Internationaux de Strasbourg. Finally, she produced her best result at a Grand Slam tournament to date by reaching the fourth round at the French Open. Stephens built on this momentum with a third round appearance in her Wimbledon main draw debut, which was highlighted by an upset of 23rd seed Petra Cetkovská. This string of performances brought her into the top 50 of the WTA rankings for the first time. Back in the United States, Stephens played at the Citi Open in late July and made it to her second career WTA semifinal. She also reached the third round at the Premier 5 Cincinnati Open, where she lost a tight match to world No. 3 Agnieszka Radwańska. Stephens's final tournament of the year was the US Open. She lost in the third round to No. 13 Ana Ivanovic after struggling with a torn abdominal muscle, which was initially injured during her fourth round loss at the French Open a few months earlier. Stephens later stated, "I kept playing when I shouldn't have," as part of an effort to try to qualify for the Olympics. She ended up taking the rest of the year off to recover. Nonetheless, she finished the year as the youngest player in the top 50 at No. 38. Stephens was ready to return for the Australian hard court season. In her first tournament back, she made it to the quarterfinals at the Brisbane International to set up an encounter with world No. 3 Serena Williams. Although Williams won the match in straight sets, she praised Stephens, saying she could be "the best in the world one day." Stephens improved on that result the following week with a semifinal at the Hobart International. She entered the Australian Open seeded 29th, her first Grand Slam tournament as a seeded player. She defeated four unseeded players to make her first Grand Slam tournament quarterfinal and set up her second clash with Williams that month. Williams entered the semifinal on a 20 match win streak, while multiple betting websites listed the 19 year-old Stephens as at least an 11-to-1 underdog. Stephens was down a set and a break early in the second set, but came from behind to pull off a huge upset. This was the first top ten victory of Stephens's career and made her much more prominent. Although Stephens would lose her next match to world No. 1 Victoria Azarenka, she rose to a career-high ranking of No. 17 after the tournament. Following the Australian Open, Stephens was forced to miss the United States's quarterfinal Fed Cup tie after aggravating her abdominal injury during her deep run at the tournament. When she returned to the court, this injury continued to hinder her performance as she did not defeat another top 50 opponent until after the clay court season. She played in the Fed Cup playoff tie in April and lost her only match against Sweden's Sofia Arvidsson. Nonetheless, the United States won the tie 3–2 to secure a place in the 2014 World Group. Despite these struggles, Stephens produced another good Grand Slam tournament result at the French Open, where she defeated three unseeded opponents – none ranked higher than No. 92 – to reach the fourth round. She then lost to world No. 2 Maria Sharapova. Stephens continued her Grand Slam tournament success at Wimbledon by making it to the quarterfinals, again without defeating a seeded opponent. She lost to the eventual champion Marion Bartoli. Her best win at these two majors came in the first round of Wimbledon against world No. 25 Jamie Hampton. At the Cincinnati Open in August, Stephens scored her second big upset of the year when she knocked out Sharapova, the No. 3 player in the world, in the second round. She lost in the next round to No. 15 Jelena Jankovic. Two weeks later, Stephens entered the US Open as the 15th seed, where she faced Williams again in the fourth round. This time, Williams avenged her Australian Open loss in straight sets and went on to win the tournament. Although Stephens continued to struggle outside of the majors after the US Open, she was named the second alternate for the WTA Tour Championships. She finished the year at world No. 12 and was one of only three players to make it to the second week of all four Grand Slam tournaments in 2013, along with Williams and Agnieszka Radwańska. Stephens also reached a career-high ranking of No. 11 in October and became the second-highest ranked American. Stephens began 2014 at the Hopman Cup with John Isner. The two Americans finished the round-robin in third place in their group, with only one rubber win against Spain. Stephens also withdrew from her last match with a wrist injury. She was able to recover in time to open her WTA season at the Australian Open. A year after her breakthrough, she reached the fourth round and was again defeated by world No. 2 Victoria Azarenka for the second consecutive year. Her next successful tournament came in March at the Indian Wells Open. Here, Stephens upset No. 13 Ana Ivanovic in the third round and went on to reach her first quarterfinal at a Premier Mandatory event. Stephens returned to the United States Fed Cup team in April for their home playoff tie against France. She played two singles matches and the decisive doubles rubber. After losing to an up-and-coming Caroline Garcia and picking up a win against Virginie Razzano, Stephens and her partner Madison Keys lost to the two of them in the final doubles match to relegate the United States into World Group II the following year. Once again, Stephens did not have a good clay court season, winning multiple matches in just two out of six tournaments. Nonetheless, her best result of the season came at the French Open, where she lost to No. 4 Simona Halep in the fourth round. In the grass court season, Stephens was seeded 18th at Wimbledon, but suffered a first round loss to world No. 109 Maria Kirilenko. This loss snapped her streak of reaching the second week of every major since a third round loss at the 2012 US Open. Stephens did not do well at the US Open either, losing in the second round to No. 96 Johanna Larsson while committing 63 unforced errors. After playing in one more tournament in September, she ended her season early to recover from a wrist injury. By the end of the year, she fell to No. 37 in the world. Stephens returned from injury to start the season at the Auckland Open and the Hobart International, but lost in the second round at both tournaments. She entered the Australian Open unseeded and faced a difficult draw against Victoria Azarenka in the first round. Azarenka eliminated Stephens for the third consecutive year. Stephens's first two successful tournaments of the year came at the Premier Mandatory events in March. She reached the fourth round at the Indian Wells Open, where she lost a three-set match to world No. 1 Serena Williams, who was returning from her long boycott of the tournament. Stephens then improved on that result with a quarterfinal appearance at the Miami Open, which included a win over rival Madison Keys in their first encounter. Despite these good results, Stephens got off to a slow start in the clay-court season. She did not return to form until late May when she reached her second semifinal at the Internationaux de Strasbourg. Having struggled at the last three Grand Slam events, Stephens managed to upset world No. 15 Venus Williams in the first round of the French Open in their first ever meeting. Serena then defeated her in the fourth round, which turned out to be Stephens's best Grand Slam tournament result of the year. In her only grass-court tune-up, Stephens made it to the semifinals at the Eastbourne International. She notably defeated world No. 9 Carla Suarez Navarro in the second round for her first top ten victory in almost two years. Stephens closed the European season with a third round appearance at Wimbledon. Stephens did not play again until the Citi Open in August. She won the tournament without dropping a set for her first career WTA title. She defeated No. 21 Sam Stosur in the semifinals and won the final against Anastasia Pavlyuchenkova while only dropping three games. The title brought Stephens back into the top 30. At the US Open, she was seeded at a Grand Slam tournament for the first time that year but lost in the first round to compatriot CoCo Vandeweghe. Stephens maintained a steady ranking all year, dropping no lower than No. 45 while rising no higher than No. 28. She finished the season at No. 30 in the world. In the offseason, Stephens hired Kamau Murray to be her new coach. Their partnership proved successful immediately. At the Auckland Open, Stephens won her first tournament with the two of them together. Due to a rain suspension, she was forced to play the end of her semifinal match against No. 17 Caroline Wozniacki as well as the entire final against Julia Görges on the same day to claim the title. Stephens would win two more WTA titles during the season. Her second title of the year also came on hard court at the Mexican Open. Her third and last title of the year came on clay at the higher-level Charleston Open, a low-level Premier event. During the semifinals of this tournament, she defeated No. 2 Angelique Kerber, who needed to retire in the second set due to an illness. Part of her prize in Charleston included a car from the title sponsor Volvo, which Stephens was unaware of until after the tournament. In contrast to previous years where Stephens struggled at smaller tournaments while still doing well at bigger tournaments, she struggled at the Grand Slam tournaments and high-level Premier events in 2016. Her best Grand Slam tournament results of the year came at the French Open and Wimbledon, where she reached the third round at both events. She also lost in the first round of the Australian Open for the second consecutive year, this time to a qualifier. Stephens's last tournament of the year was the 2016 Rio Olympics, which ended with a first round loss to Eugenie Bouchard. After the Olympics, Stephens revealed she had been hindered by a left foot injury for most of the year, for which doctors recommended time off to recover. She finally did end her season upon being diagnosed with a stress fracture. Although she was initially expected to only miss several months, it was later discovered that she would need surgery that would keep her out for the first half of 2017 as well. At the time of her last WTA event of the year at the end of July, Stephens was ranked No. 22 in the world. Stephens had foot surgery in January and could not walk again without a boot until the middle of April. While unable to play on the tour, Stephens was granted the opportunity to be a broadcaster for the Tennis Channel. She attended several WTA events in the United States including the Indian Wells Open, the Miami Open, and the Charleston Open, where she interviewed fellow tennis players and also provided analysis. Stephens returned to the WTA Tour in July for Wimbledon, about 11 months after her last match and with her ranking having dropped to No. 336. She lost her first two matches back, one to compatriot Alison Riske at Wimbledon, and the other to No. 2 Simona Halep at the Citi Open. However, she showed some signs of improvement by reaching the doubles final at the Citi Open with Eugenie Bouchard. By August, Stephens's ranking had continued to fall to as low as No. 957. But she was able to reach the semifinals of both Premier 5 tournaments that month, the Canadian Open and the Cincinnati Open. During each tournament, she defeated four top 50 players including Lucie Šafářová and 14th-seed Petra Kvitová at both events, and also No. 3 Angelique Kerber. Stephens was defeated by a top ten player in both semifinals, No. 6 Caroline Wozniacki in Canada and No. 2 Halep again in Cincinnati. Stephens had entered the month having never reached a semifinal at a high-level Premier tournament. With these results, Stephens climbed back into the top 100 of the WTA rankings. Stephens entered the US Open at No. 83 in the world, and still needed to use a protected ranking to be accepted into the main draw due to the entry deadline being over a month before the event. Her first upset of the tournament came in the second round over No. 10 Dominika Cibulková. In the fourth round, she defeated No. 33 Julia Görges to advance to her first US Open quarterfinal and her first major quarterfinal since Wimbledon in 2013. She then defeated No. 17 Anastasija Sevastova to set up the first all-American semifinals at a major since Wimbledon in 1985, and the first at the US Open since 1981. Her semifinal was against No. 9 Venus Williams. After two lopsided split sets, Stephens won a tight third set to reach her first Grand Slam singles final. Madison Keys won the other semifinal against CoCo Vandeweghe. Stephens closed out the tournament by defeating Keys in straight sets to win her first Grand Slam tournament title. She became the first American woman other than the Williams sisters to win a major title since Jennifer Capriati won the Australian Open in 2002 and the first to win the US Open since Lindsay Davenport in 1998. She also became the lowest-ranked US Open champion ever, and the fifth-lowest at any Grand Slam tournament. After the US Open, Stephens did not win another match the rest of the season. This stretch notably included two matches at the year-end WTA Elite Trophy as well as two singles rubbers in the Fed Cup final against Belarus. Nonetheless, the United States won the tie 3–2 to give Stephens her first Fed Cup crown. This was the first title for the United States since 2000. Stephens finished the season ranked No. 13 and was named WTA Comeback Player of the Year. Stephens extended her losing streak to eight matches at the Australian Open. She dismissed concerns about her form from the media, saying, "Everything's good. Just relax, everybody. It'll be okay, don't worry." In the coming months she would prove to be correct, first by snapping her losing streak at her next tournament in . In March, Stephens returned to form and won the Miami Open, her first Premier Mandatory title. She defeated three top 10 players at the event, including No. 3 Garbiñe Muguruza and No. 10 Angelique Kerber in the fourth round and quarterfinals, and No. 5 Jeļena Ostapenko in the final. With this performance, she also cracked the top 10 for the first time. Despite winning the second biggest title of her career, Stephens was unable to make the quarterfinals in any of her French Open preparation tournaments. The highlight of her clay-court season in the lead up to the French Open was the Fed Cup semifinals on the road against France, where she won both of her singles rubbers over Pauline Parmentier and Kristina Mladenovic to lead the United States to a 3–2 victory. Stephens entered the French Open having never reached the quarterfinals. However, she was able to produce her best result at the tournament, making it to the final. In the semifinals, Stephens won a rematch of the 2017 US Open final against Madison Keys, the first all-American semifinal there since 2002. Despite going up a set and a break, Stephens lost the final to world No. 1 Simona Halep, her first loss in a WTA singles final. Nonetheless, this run catapulted her to a career-high ranking of No. 4 in the world, making her the first American woman other than the Williams sisters to be ranked in the top 5 in singles since Lindsay Davenport in 2006. Stephens did not carry any momentum into the grass-court season, losing at Wimbledon in the first round in her only event. Nonetheless, she moved up to No. 3 in the singles rankings after the tournament. With a higher seed, Stephens had a strong US Open series for the second consecutive year. She finished runner-up at the Canadian Open to Halep, her second high-level Premier final of the year. At the US Open, Stephens was unable to defend her title, losing to Anastasija Sevastova in the quarterfinals in a rematch of last year's meeting at this tournament in the same round. For the second straight year, Stephens began the Asian hard court season with multiple losses. However, unlike the previous year, Stephens was able to win two matches on the continent at the China Open. She then closed out the season by participating in her first WTA Finals in Singapore. In the round robin stage, Stephens swept her group of Naomi Osaka, Kiki Bertens, and Angelique Kerber to advance to the knockout stage. After a dismal start in the semifinals where she lost the first eight games of the match against Karolína Plíšková, she recovered and won the match in three sets. In her final match of the season, Stephens was able to win the first set against Elina Svitolina, but ultimately lost the match. She finished the season ranked No. 6 in the world, her best year-end ranking to date. Stephens opened up her year losing two of her first three matches, losing to Johanna Konta in Brisbane and Yulia Putintseva in Sydney. Coming into the Australian Open as the fifth seed, Stephens defeated compatriot Taylor Townsend in the first round to notch her first win in Melbourne since 2014. Straight set wins over Tímea Babos and 31st seed Petra Martić followed before Stephens was upset in the fourth round by Anastasia Pavlyuchenkova in three sets. Stephens's biggest rivalry is with her close friend and compatriot Madison Keys. Keys has said, "Sloane and I, since we were 12 and 14, have constantly been compared to each other." Both players have been ranked in the top 10 by the WTA. They have also both been labelled as leaders of the next generation of American women's tennis. In spite of their rivalry, the two have looked forward to their matchups, with Stephens saying, "Every time I get to play Maddy is great. Another opportunity for the both of us." Keys has said, "I always want to see Sloane do well. I'd love for both of us to be able to be in the position to play each other multiple times. ... I'm always cheering for her." Stephens has a 3–1 record against Madison Keys, winning the their first three matches in straight sets. After their first meeting in the second round of the 2015 Miami Open, their next two encounters were both two of the most important matches of their careers. In 2017, Stephens defeated Keys in the final of the US Open to win her first major title. She then won their next meeting in the semifinals of the 2018 French Open to reach her second Grand Slam singles final. Keys defeated Stephens for the first time in the quarterfinals of the 2019 Charleston Open. Stephens has frequently been regarded as a potential successor to Serena Williams to become the next top American women's tennis player, if not the best in the world. She grew up as a fan of the Williams sisters, but had lost some of her interest in them after they did not sign autographs at a Fed Cup tie that Stephens attended at age 12. She considered them to be friends when she was starting out on the pro tour, but described Serena as simply a colleague in early 2015. Her relationship with Serena became strained after their match at the 2013 Australian Open. After Stephens's victory against her at the tournament, Serena commented, "I made you," in a tweet believed to be directed at Stephens and did not speak to her younger compatriot until at least May. Nonetheless, Stephens has said the two of them still had a good relationship. Stephens has a 1–5 record against Serena Williams, with three of their matches coming in 2013 and the other three in 2015. Her only victory against Serena came at the 2013 Australian Open when she was still relatively unknown as a 19-year old. The match win and her run into a Grand Slam singles semifinal garnered international attention and put her on the cusp of cracking the top 10 of the WTA rankings later in the season. With Serena entering the match in excellent form and also having defeated her much younger opponent earlier that month, Stephens was listed as high as a 16-to-1 underdog. All of their matches since have been contested at high-level Premier tournaments or Grand Slam tournaments. In 2015, Stephens won the first set of their encounters at the Indian Wells Open and the French Open, but ultimately lost in three sets in both instances. Stephens and Halep have built a rivalry centered around their highest profile matches in 2018. Because Halep has dominated their matches, Stephens has downplayed their rivalry, saying, "It's not a rivalry if you don't beat the person." International Tennis Hall of Famer Chris Evert has praised their rivalry, saying, "I liked [their match in the 2018 Canadian Open final] a lot, because that is a contrast in personalities and styles, in moods, in coaches. That is a definite contest." Stephens has a 2–7 record against Halep. Halep won their first encounter in 2012 at the Barcelona Ladies Open. Stephens then won their next two meetings in early 2013, including a first round match at the Australian Open as part of her breakthrough semifinal run at the event. Both of these wins came before Halep entered the top ten in 2014. Since then, Halep has won all six of their encounters. Their two biggest matches came in 2018, both of which were three set finals. In the first such match, the French Open final, Halep came from a set down to defeat Stephens for her first Grand Slam title. This was only the fourth time in the previous 47 Grand Slam singles finals where the winner of the first set was unable to win the match. Their next big match, the final at the Canadian Open, was ranked as the match of the year by the WTA. Halep won the first set of the match after saving four set points, two while serving at 6–5 and two more in the tiebreak. After Stephens was able to push the match to three sets Halep was able to regroup and win the match. Prior to these finals, Stephens had never lost a final on the WTA Tour. Stephens is an all-court player, having reached the quarterfinals or better at all four majors. Her favorite surface is clay, on which she was a finalist at the French Open. However, most of her best results have come on hard courts, including her US Open and Miami Open titles, as well as five of her six titles in total. She has never won a professional title on grass, and Wimbledon is the only Grand Slam event where she has not made it to at least the semifinals. Stephens often plays behind the baseline, relying on her athleticism to defend against her opponent's shots. She excels at countering powerfully-hit shots, and is capable of turning defense into offense. Stephens' game is commonly referred to as possessing "easy power" due to the seemingly casual nature in which she injects pace into her shots. She sometimes flattens out her shots, even on the run, and goes for stinging winners. Stephens has the ability to hit powerful winners as she takes large swings with her forehand. In contrast, she has a more compact swing with her two-handed backhand. She favors her forehand, and will run around her backhand at times to play her stronger groundstroke. Stephens excels in point construction, and varies patterns of hitting in order to confuse opponents. Stephens has an uncharacteristic style of play compared to her fellow top-ranked American contemporaries. Whereas the other leading Americans are some of the most aggressive players on the WTA Tour, Stephens has a more passive approach. According to the Aggression Score Metric, which measures a player's aggression based on how quickly they end points — either through a winner, an unforced error, or an opponent's forced error, Stephens has a score of 19.4% — which implies that 19.4% of her shots lead to one of those three outcomes. This score is average compared to other women's tennis players, and rates similarly to fellow Grand Slam tournament winners Justine Henin and Victoria Azarenka. In contrast, Venus Williams is amongst the top 20% of most aggressive players, while Serena Williams, Madison Keys, and CoCo Vandeweghe are all in the top 10% with aggression scores above 25%. Stephens has been perceived as having a nonchalant attitude towards losing matches and striving to meet expectations. Her former junior coach Chris Evert has questioned her motivation on multiple occasions and attributed stretches of inconsistency at various times in her career to her mentality. On the contrary, Stephens has also shown the ability to use her mindset of not worrying about disappointing outcomes to bounce back from injury and poor tournaments. She demonstrated this type of mindset after her early 2014 US Open loss, saying, "I'm not gonna dwell on this. I'm just gonna keep improving and getting better and looking forward to the next tournaments." When Stephens was just starting to play tennis at the Sierra Sport and Racquet Club, one of her first instructors was Francisco González, a retired professional tennis player once ranked in the top 50. Upon his recommendation, Stephens moved to Florida to train at an elite junior tennis academy. Although she started out at the Evert Tennis Academy for a year working with John and Chris Evert, she then moved to the Nick Saviano High Performance Tennis Academy, where she stayed for several years. Roger Smith began coaching Stephens in early 2009 and worked with her for several years. With Smith as her coach, she became a top-ranked junior with three Grand Slam tournament doubles titles and also cracked the top 100 of the WTA rankings. In June 2012, Stephens switched coaches to David Nainkin in order to try to qualify for the 2012 Olympics. Although her ranking was high enough to qualify, she narrowly missed out on that goal as she was the fifth-highest ranked American with each country only being allotted at most four players in each draw. Nonetheless, under Nainkin, Stephens had her breakthrough tournament at the 2013 Australian Open and reached a career-best ranking of No. 11 in the world. She parted with him after the 2013 season in order to find a full-time coach. Nainkin had also been working with fellow American Sam Querrey that year. Stephens replaced him with Paul Annacone, who is better known for coaching two of the greatest players in tennis history in Pete Sampras and Roger Federer. She became the first woman to be coached by Annacone. Although the pair worked well together, Stephens split with Annacone in late 2014 after not matching the success from her previous year that season. Stephens briefly worked with Thomas Högstedt in late 2014. At the start of 2015, she returned to her longtime junior coach, Nick Saviano. While working with Saviano, Stephens won her first WTA title, but did not manage to ascend back up the WTA rankings. In the 2015 offseason, she replaced him with Kamau Murray. With Murray as her coach, Stephens established herself as one of the best players in women's tennis. She has since won five of her six titles, including three in 2016, her first major at the 2017 US Open, and her first Premier Mandatory title in 2018. She has also reached a new career-high ranking at No. 3 in the world. Stephens is represented by TLA Worldwide. She has been sponsored by Nike since the start of 2018. Her clothing sponsor had previously been Under Armour since 2010. Stephens uses Head rackets, specifically the Graphene XT Radical Pro model as of 2018. Following her US Open victory, Stephens accrued several new sponsors, including the automobile manufacturer Mercedes-Benz. She has also appeared in television advertisements for Built with Chocolate Milk, a campaign to encourage chocolate milk as a recovery drink. Her other health-related endorsements include doTerra, Precision Nutrition, and Colgate. doTerra is a company that primarily sells essential oils, while Precision Nutrition provides coaching for diet and exercise. With Colgate, Stephens is a part of their Bright Smiles, Bright Futures campaign that focuses on educating children about oral hygiene. Stephens has previously signed a deal with the American Express credit card company and was formerly an endorser of the Listerine mouthwash product. She was also a brand ambassador for USANA, a nutrition company. Moreover, Stephens has worked with Time Warner Cable as part of their Connect a Million Minds campaign to motivate the importance of education in science, technology, engineering, and math (STEM) fields. Stephens credits her mother for supporting her career as a tennis player since she was very young. When she won the 2017 US Open, she recalled an instance at age 11 when her mother believed Stephens had high upside in spite of being told by an instructor at a junior tennis academy that she would be lucky to get a tennis scholarship to a Division II college. Stephens is of Trinidadian descent through her maternal grandfather Noel Smith, who came to the United States from Trinidad to pursue a career as a doctor. She has cited her grandfather as her hero and one of her biggest influences growing up. Stephens's favorite player growing up was Kim Clijsters, who congratulated Stephens in person after her 2017 US Open title. She was also a fan of the Williams sisters and kept a poster of Serena in her bedroom as a kid. Although she disliked that they were uninterested in signing autographs at a match she attended and has also commented that neither of them tried to serve as one of her mentors, Stephens has stated she developed a good relationship with the Williams sisters. She also noted that she has read Serena's autobiography and respects her strong personality. Stephens has worked with Soles4Souls, a charity that collects new and used shoes to give to children in poverty. She also started the Sloane Stephens Foundation, which helps build tennis courts and set up after-school tennis programs for underserved students in conjunction with supplemental tutoring. The foundation is run by Stephens, her mother, and her uncle Ronald Smith. They have organized programs in Compton, Fresno, and Fort Lauderdale. Stephens is dating United States national soccer team player Jozy Altidore, who was also one of her childhood friends from living in Florida. She had previously dated fellow American tennis player Jack Sock for over a year. In late 2017, Stephens graduated from Indiana University East with a bachelor's degree in communications studies. She finished her degree while recovering from foot surgery earlier in the year. She credits her time away from playing tennis that was spent on her studies and her job with the Tennis Channel for improving her perspective on being a professional tennis player. ^ "Sloane Stephens, WTA – Tennis". CBSSports.com. Retrieved July 6, 2018. ^ "Sloane Stephens". WTA Tennis. Retrieved August 8, 2018. ^ a b "Sloane Stephens Straight Talk, part 2". Costa del Tennis. Retrieved June 26, 2018. ^ "Sybil Smith". Boston University Athletic Hall of Fame. Retrieved June 20, 2018. ^ a b Crouse, Karen (September 5, 2009). "For a Rising Tennis Star, a Connection, Then Dealing With Loss". "New York Times Straight Sets Blog". Retrieved December 27, 2009. ^ "A Father's Pride". Sports on Earth. Retrieved June 20, 2018. ^ "Serena's Heir". TIME. Retrieved June 20, 2018. ^ "They want another Serena". espnW. Retrieved June 20, 2018. ^ "Who is … Sloane Stephens?". NBC Olympics. Archived from the original on June 20, 2018. Retrieved June 20, 2018. ^ a b Dzidrums, Christine (April 4, 2018). Sloane Stephens: A Children's Biography: SportStars Volume 7. Creative Media Publishing. ^ "She beat Venus to reach the U.S. Open final. A look at Sloane Stephens' Fresno ties". Fresno Bee. Retrieved June 20, 2018. ^ a b "WTA star Sloane Stephens expands youth programs in Fresno". Fresno Bee. Archived from the original on February 16, 2013. Retrieved June 20, 2018. ^ Tran, Tommy. "Tennis Pro Sloane Stephens Has Valley Roots". ABC 30 Action News. Retrieved September 19, 2013. ^ a b "Stephens on the rise in girls' tennis". Rivals High from Yahoo Sports. Archived from the original on February 16, 2013. Retrieved June 20, 2018. ^ a b "Is Sloane Stephens the Future of American Tennis?". Elle. Retrieved June 20, 2018. ^ a b c "BNP Paribas Open March 13, 2010 Sloane Stephens". ASAP Sports. Retrieved June 26, 2018. ^ a b c "Sloane Stephens Junior Player Activity". "ITF". Retrieved June 20, 2018. ^ "Burdette and Stephens Fall in Doubles Final; Net Cord Decides Boys Doubles Champions". ZooTennis.com. Retrieved June 21, 2018. ^ "Kudla and Van Nguyen Win Orange Bowl 16s Championships; Jenkins Meets Bhambri and Boserup Faces McHale for 18s Titles Sunday". ZooTennis.com. Retrieved June 21, 2018. ^ "Stephens and Frank Collect International Spring Singles Championships". ZooTennis.com. Retrieved June 21, 2018. ^ "More on NCAA Champions; Stephens Wins Italian Open". ZooTennis.com. Retrieved June 21, 2018. ^ "A Teenager Bows Out and Looks to Wimbledon". New York Times. Retrieved June 21, 2018. ^ "Junior Watch: Stephens Loses to Mladenovic". New York Times. Retrieved June 21, 2018. ^ "Lauren Davis Upsets Third Seed Babos; Stephens Advances in Three Sets at US Open Junior Championships". ZooTennis.com. Retrieved June 21, 2018. ^ "Australian Open Junior Roll of Honour" (PDF). ITF Tennis. Retrieved August 8, 2018. ^ "French Open Junior Roll of Honour" (PDF). ITF Tennis. Retrieved August 8, 2018. ^ "Wimbledon Junior Roll of Honour" (PDF). ITF Tennis. Retrieved August 8, 2018. ^ "US Open Junior Roll of Honour" (PDF). ITF Tennis. Retrieved August 8, 2018. ^ "NCAA Individual Recap; Recruiting Class Rankings; ITA Kickoff Draft Complete; US Girls Fall in Paris; USTA's Sell Talks with Cronin". ZooTennis.com. Retrieved August 9, 2018. ^ "June Aces; Kudla and Stephens Fall in Wimbledon Jr. Quarterfinals, while Britain's Golding and Robson Advance to Semis". ZooTennis.com. Retrieved August 9, 2018. ^ "Sock and Kudla Vie For U.S. Open Boys Title; Gavrilova and Putintseva of Russia Will Decide Girls Champion Sunday". ZooTennis.com. Retrieved June 21, 2018. ^ "Sony Ericsson Open Qualifying Underway". ZooTennis.com. Retrieved June 25, 2018. ^ "Miami 23 March – 05 April 2009". ITF Tennis. Retrieved August 8, 2018. ^ "Qualifying Underway at Sony Ericsson, US Juniors Not Faring Well; ISC Carson Acceptances". ZooTennis.com. Retrieved August 8, 2018. ^ "Day One of US Open Qualifying; El Mihdawy Considers Tennis Future". ZooTennis.com. Retrieved June 25, 2018. ^ "First Day of US Open Qualifying a Long One". ZooTennis.com. Retrieved August 8, 2018. ^ "Gullickson Draws Wozniacki in US Open First Round; Qualifying's First Round Finally Complete". ZooTennis.com. Retrieved August 8, 2018. ^ "Elsewhere in Tennis....Devvarman Wins Rochester, Embree Takes Wichita, Keys Triumphs in Bahamas". ZooTennis.com. Retrieved June 25, 2018. ^ "Buzz Pick All-USTA-Juniors Squad in World TeamTennis Draft". "Tennis-x.com". Retrieved December 27, 2009. ^ "Stephens gets first WTA Tour win at Indian Wells". San Diego Tribune. Retrieved June 26, 2018. ^ "Kudla, Stephens Win ATP, WTA Matches Tuesday; US Open Junior Fact Sheet; Rochester Futures Slideshow; Brad Stine Opens Junior Academy". ZooTennis.com. Retrieved June 26, 2018. ^ a b "Sloane Stephens Statistics". Core Tennis. Retrieved June 26, 2018. ^ a b c d e f g h i "Sloane Stephens Rankings History". WTA Tennis. Retrieved June 26, 2018. ^ "New Haven Open: Sloane Stephens on her way up". New Haven Register. Retrieved June 26, 2018. ^ "Sloane Stephens: Disparity in results soon to be history?". Vavel. Retrieved June 26, 2018. ^ "Mercury Insurance Open Preview". US Open Series. Retrieved June 26, 2018. ^ "US Open – American teen Stephens upsets 23rd seed Peer". Tennis World USA. Retrieved June 26, 2018. ^ "Sloane Stephens, Vania King win at 2011 U.S. Open Thursday, lead resurgence of Unites States players". New York Daily News. Retrieved June 26, 2018. ^ "Australian Open – Sloane Stephens reaches second round". Tennis World USA. Retrieved June 26, 2018. ^ "Miami, Vinci promossa A casa gli altri azzurri". Gazzetta. Retrieved June 26, 2018. ^ "Serena Williams-led U.S. advances". ESPN. Retrieved June 26, 2018. ^ "Schiavone & Cornet's Strasbourg Revivals". WTA Tennis. Retrieved June 26, 2018. ^ "Stephens can't write fairy-tale ending at French". espnW. Retrieved June 26, 2018. ^ "2012 Wimbledon: Sloane Stephens Advances, Samantha Stosur Out". Tampa Bay SB Nation. Retrieved June 26, 2018. ^ "Western & Southern Open Awards Wild Cards To James Blake, Sloane Stephens And Camila Giorgi". Western and Southern Open. Retrieved June 27, 2018. ^ "What's in a name? For Sloane Stephens, the beginning of a friendship". Washington Times. Retrieved June 27, 2018. ^ "Cincinnati: A. Radwanska d. Stephens". Tennis.com. Retrieved June 27, 2018. ^ a b "Sloane Stephens Ready to Sparkle in 2013". Tennis Now. Retrieved June 27, 2018. ^ "Serena Williams advances at Brisbane". Los Angeles Times. Retrieved June 27, 2018. ^ "Sloane Stephens falls in semis". ESPN. Retrieved June 27, 2018. ^ "Serena Williams upset by American". ESPN. Retrieved June 27, 2018. ^ "WIL 1–2 Serena Williams vs. Sloane Stephens Match Summary". FlashScore.com. Retrieved June 27, 2018. ^ a b "Stephens Upsets Williams in Stunner". New York Times. Retrieved June 27, 2018. ^ "Victoria Azarenka in Aussie final". ESPN. Retrieved June 27, 2018. ^ a b c d "The Stars and Stripes in 2013: Sloane Stephens". Tennis View Magazine. Retrieved June 27, 2018. ^ "Serena, Venus lift USA past Sweden in Fed Cup". USA Today. Retrieved August 9, 2018. ^ "Sloane Stephens rallies to advance". ESPN. Retrieved June 27, 2018. ^ "Stephens' maturation continues as she exits French Open quietly". Sports Illustrated. Retrieved June 27, 2018. ^ "Wimbledon: Sloane Stephens steals spotlight from Serena Williams — again". The Guardian. Retrieved June 27, 2018. ^ a b c d "Sloane Stephens Matches". WTA Tennis. Retrieved June 27, 2018. ^ "Maria Sharapova beaten by Sloane Stephens in second round of Cincinnati Masters". Telegraph. Retrieved June 27, 2018. ^ "USTA FL Friday Blog: Roddick Debut on FOX Sports 1; Tennis on TV". USTA Florida. Retrieved August 8, 2018. ^ a b "Serena Williams defeats Sloane Stephens in fourth round of U.S. Open". Sports Illustrated. Retrieved June 28, 2018. ^ "WTA – Caroline Wozniacki and Sloane Stephens head to Istanbul as alternates". Tennis World USA. Retrieved June 27, 2018. ^ "Venus Williams, Sloane Stephens withdraw from Hobart International". Tennis World USA. Retrieved June 28, 2018. ^ "Australian Open 2014: Victoria Azarenka breezes past Sloane Stephens to dispel memories of controversial victory last year". Independent. Retrieved June 28, 2018. ^ "Sloane Stephens advances to Indian Wells quarterfinals in strong outing". Sports Illustrated. Retrieved June 28, 2018. ^ "France stun USA to seal World Group place". Fed Cup. Retrieved June 28, 2018. ^ "French Open 2014: Simona Halep beats Sloane Stephens in fourth round". The Guardian. Retrieved June 28, 2018. ^ "Sloane Stephens ousted in first round at Wimbledon by Maria Kirilenko". New York Daily News. Retrieved June 28, 2018. ^ "Sloane Stephens falls in second round of U.S. Open". USA Today. Retrieved June 28, 2018. ^ "What's Next for Sloane Stephens After Early 2015 Australian Open Exit?". Bleacher Report. Retrieved June 28, 2018. ^ "Stephens Falls to Fellow American Davis in Auckland". Long Island Tennis Magazine. Retrieved June 29, 2018. ^ "Heather Watson upsets Sloane Stephens 6–3, 6–1 at Hobart International". The Guardian. Retrieved June 29, 2018. ^ "Australian Open 2015: Sloane Stephens stalls as Victoria Azarenka looks her challenge in the eyes". Sydney Morning Herald. Retrieved June 29, 2018. ^ a b "Serena Williams wins in 3 sets". ESPN. Retrieved June 29, 2018. ^ a b "Sloane Stephens tops Madison Keys at Miami Open in 'next-generation' match". Miami Herald. Retrieved June 29, 2018. ^ "Simona Halep gets past Sloane Stephens to reach Miami Open semi-finals". Tennis World USA. Retrieved June 29, 2018. ^ "Stosur Ends Stephens' Strasbourg Hopes". WTA Tennis. Retrieved June 29, 2018. ^ "French Open: Sloane Stephens defeats Venus Williams – as it happened". The Guardian. Retrieved June 29, 2018. ^ a b "Serena Williams beats Sloane Stephens to reach French Open last eight". The Guardian. Retrieved June 29, 2018. ^ "WTA Eastbourne: Sloane Stephens En Huitième De Finale". Africa Top Sports. Retrieved June 29, 2018. ^ "CoCo Vandeweghe overpowering at Wimbledon, pushes into round of 16". Sporting News. Retrieved August 9, 2018. ^ "Sloane Stephens wins Citi Open for first WTA title". Washington Post. Retrieved June 29, 2018. ^ "CoCo Vandeweghe grants on-court interview during changeover". ESPN. Retrieved June 29, 2018. ^ a b "Simona Halep will try to break through vs. Sloane Stephens, who knows the feeling". Washington Post. Retrieved June 29, 2018. ^ "Sloane Stephens beats Julia Goerges in ASB Classic final". ESPN. Retrieved June 29, 2018. ^ "Sloane Stephens Wins Auckland". WTA Tennis. Retrieved June 29, 2018. ^ "Stephens Wins Acapulco Title In Epic". WTA Tennis. Retrieved June 29, 2018. ^ "Stephens Strikes Gold In Charleston". WTA Tennis. Retrieved June 29, 2018. ^ "Kerber Retires With Illness In Charleston, But Take Nothing Away From Stephens". Tennis.com. Retrieved June 29, 2018. ^ "Stephens wins Third Tournament of 2016 in Charleston". Tennis.com. Retrieved June 29, 2018. ^ "For at least one post-match embrace Sunday at Wimbledon, 'quality was good'". Washington Post. Retrieved June 29, 2018. ^ "Sloane Stephens exits, again, in Australian Open 1st round". USA Today. Retrieved June 29, 2018. ^ "Bouchard beats Stephens in Olympic debut at Rio 2016". Canadian Olympic Team Official Website. Retrieved June 29, 2018. ^ "Coping With Injury: Inside the Mind of Pro Tennis Player Sloane Stephens". My Fitness Pal. Retrieved June 30, 2018. ^ "The Complex Rise of Sloane Stephens". Sports Illustrated. Retrieved June 30, 2018. ^ "How Sloane Stephens's Tennis Channel Gig Helped her During Injury Recovery". Sports Illustrated. Retrieved June 30, 2018. ^ "After long layoff, Sloane Stephens sees some positives in Wimbledon loss". USA Today. Retrieved June 30, 2018. ^ "No. 2-ranked Simona Halep handles American Sloane Stephens at Citi Open". Washington Post. Retrieved June 30, 2018. ^ "Bouchard, Stephens fall in Citi Open finals, shift focus to Rogers Cup". Sporting News. Retrieved June 30, 2018. ^ "Wozniacki ends Stephens' Toronto run, roars into final". WTA Tennis. Retrieved June 30, 2018. ^ "Stephens surge continues in Cincinnati". WTA Tennis. Retrieved June 30, 2018. ^ Berg, Aimee (August 30, 2017). "Stephens pulls out three-set win over Cibulkova". www.usopen.org. US Open. Retrieved September 9, 2017. ^ Nguyen, Courtney (September 5, 2017). "Stats Corner: American quartet soars into US Open quarterfinals". WTA. Retrieved September 9, 2017. ^ "U.S. Open: Madison Keys beats Kaia Kanepi to complete American sweep of women's semifinals". USA Today. Retrieved June 4, 2018. ^ "No. 5 of '17: Stephens Emerges As Star After Beating Venus At US Open". Tennis.com. Retrieved June 30, 2018. ^ Waldstein, David (September 7, 2017). "Sloane Stephens and Madison Keys Reach U.S. Open Final". The New York Times. Retrieved September 9, 2017. ^ a b Culpepper, Chuck (September 9, 2017). "Sloane Stephens completes magical U.S. Open with win over Madison Keys in final". The Washington Post. Retrieved September 9, 2017. ^ "Sloane Stephens surges past Madison Keys to win US Open title". Guardian. September 10, 2017. Retrieved September 19, 2017. ^ "Venus and Serena's worthy successors have arrived". New York Post. Retrieved June 30, 2018. ^ "U.S. Open 2017 Women's Final Predictions: Sloane Stephens vs. Madison Keys". Sports Illustrated. September 8, 2017. Retrieved September 9, 2017. ^ "Sloane Stephens wins US Open title after straight-sets victory over fellow American Madison Keys". Mirror. Retrieved June 30, 2018. ^ "50 for 50: Sloane Stephens, 2017 women's singles champion". US Open. Retrieved June 30, 2018. ^ "Strycova caps year with win as Stephens retires in Zhuhai". WTA Tennis. Retrieved June 30, 2018. ^ "USA claims 2017 Fed Cup after Belarus battle". WTA Tennis. Retrieved June 30, 2018. ^ "United States Ends 17-Year Drought With Fed Cup Victory". New York Times. Retrieved June 30, 2018. ^ "Comeback Player of the Year: Sloane Stephens". WTA Tennis. Retrieved June 30, 2018. ^ "Stephens asks reporters to relax after loss to Zhang". Fox Sports ASIA. Retrieved June 30, 2018. ^ "Acapulco: Sloane Stephens snaps eight-match losing streak". Tennis Mash. Retrieved June 30, 2018. ^ "Miami Open: Sloane Stephens beats Jelena Ostapenko to win first title since US Open". BBC. Retrieved June 30, 2018. ^ a b "Sloane Stephens beats Jelena Ostapenko for Miami Open title". ESPN. Retrieved June 30, 2018. ^ "Madison Keys, Sloane Stephens Send U.S Into Second Straight Fed Cup Final". Sports Illustrated. Retrieved June 30, 2018. ^ "All-American French Open women's semifinal has South Florida ties". Miami Herald. Retrieved June 8, 2018. ^ a b "Sloane Stephens Subtly Defused Madison Keys In French Open Semifinals". Tennis.com. Retrieved June 8, 2018. ^ a b "Halep lifts first Grand Slam trophy at Roland Garros". WTA Tennis. June 9, 2018. Retrieved June 9, 2018. ^ a b "French Open 2018: Sloane Stephens' final collapse could be a turning point in her career – for the better". CBS Sports. Retrieved June 30, 2018. ^ "Vekic stuns Stephens in first-round Wimbledon upset". WTA Tennis. July 2, 2018. Retrieved July 2, 2018. ^ a b "Halep survives Stephens in grueling battle to win Montreal". WTA Tennis. Retrieved September 4, 2018. ^ "Sevastova stops Stephens title defense in US Open QF stunner". WTA Tennis. Retrieved September 4, 2018. ^ "Stephens slides past Pavlyuchenkova in Beijing epic". WTA Tennis. Retrieved November 8, 2018. ^ "Stephens storms past home hope Zheng in Beijing". WTA Tennis. Retrieved November 8, 2018. ^ "Steely Stephens steers past Osaka in Singapore showdown". WTA Tennis. Retrieved November 8, 2018. ^ "Stephens snaps Bertens streak, Red Group wide open in Singapore". WTA Tennis. Retrieved November 8, 2018. ^ "Stephens stops Kerber to complete Singapore semifinal lineup". WTA Tennis. Retrieved November 8, 2018. ^ "Stephens completes stunning Pliskova comeback, seals Singapore final spot". WTA Tennis. Retrieved November 8, 2018. ^ "Elina Svitolina Beats Sloane Stephens to Win the WTA Finals". New York Times. Retrieved November 8, 2018. ^ "U.S. Open Loss Behind Her, Madison Keys Accentuates the Positive". New York Times. Retrieved February 11, 2018. ^ "Madison Keys will crack top 10 in world rankings after reaching Birmingham final". LA Times. Retrieved June 20, 2016. ^ "Why is it the American women are thriving at the US Open?". espnW. Retrieved June 18, 2018. ^ "Keys leads next generation of American women at U.S. Open". Reuters. Retrieved June 2, 2018. ^ "Sloane Stephens and Madison Keys Highlight New Wave of American Female Tennis Players". Last Word on Tennis. Retrieved June 18, 2018. ^ "W2W4 at US Open: Advantage Madison Keys or Sloane Stephens?". ESPN. Retrieved June 18, 2018. ^ "A rematch we've been waiting on: Madison Keys vs. Sloane Stephens". The Undefeated. Retrieved July 4, 2018. ^ "American pals Sloane Stephens, Madison Keys both reach first French Open QF". USA Today. Retrieved July 4, 2018. ^ "Madison Keys vs Sloane Stephens Head-to-Head". Match Stat. Retrieved June 6, 2018. ^ "Win or lose, Sloane Stephens is back and better than ever". espnW. Retrieved July 4, 2018. ^ "U.S. Open: Venus Williams vs. Sloane Stephens is a look into past and future". Newsday. Retrieved July 4, 2018. ^ "The US Open showed black women have made American tennis great again". The Guardian. Retrieved July 4, 2018. ^ "Finding Serena Williams' successor(s?)". Sports Keeda. Retrieved July 4, 2018. ^ a b "Once friends, Serena Williams, Sloane Stephens redefine relationship". USA Today. Retrieved July 4, 2018. ^ ""They want another Serena"". espnW. Retrieved July 4, 2018. ^ a b "Sloane Stephens blasts Serena Williams". Sports Illustrated. Retrieved July 4, 2018. ^ "Sloane Stephens says she was caught off guard by Serena Williams controversy". Sports Illustrated. Retrieved July 4, 2018. ^ a b c "Serena Williams vs. Sloane Stephens Head to Head". MatchStat. Retrieved July 4, 2018. ^ "2018 US Open Media Day: Stephens downplays Halep 'rivalry', Wozniacki '100%'". WTA Tennis. Retrieved December 16, 2018. ^ "Evert - 'I like the contrast in personalities and styles' in Halep, Stephens rivalry". WTA Tennis. Retrieved December 16, 2018. ^ "Simona Halep vs Sloane Stephens H2H". MatchStat. Retrieved December 16, 2018. ^ "French Open final recap: Simona Halep BEATS Sloane Stephens to win Roland Garros title". Sunday Express. Retrieved December 16, 2018. ^ "Australian Open: Serena Williams hurts ankle in easy win, while Roger Federer and Andy Murray win in straight sets". The Star. Retrieved December 16, 2018. ^ "Simona Halep Rankings History". WTA Tennis. Retrieved December 16, 2018. ^ "Simona Halep beats Sloane Stephens for first Grand Slam title". ESPN. Retrieved December 16, 2018. ^ "Top 5 WTA 2018 Matches (No.1): Halep bests Stephens in marathon Montreal final". WTA Tennis. Retrieved December 16, 2018. ^ a b "Sloane Stephens: "I am happy that I was the last person to win at Key Biscayne"". Ubi Tennis. Retrieved July 4, 2018. ^ "How Sloane Stephens' Subtle Athleticism Brought Her Another Big Title". Tennis.com. Retrieved July 4, 2018. ^ "Rule the Court Like Tennis Star Sloane Stephens". Shape. Retrieved July 4, 2018. ^ "Sloane Stephens Biography And Detailed Game Analysis". Retrieved August 9, 2017. ^ "Sloane Stephens shows you don't have to be aggressive to win a major". The Economist. Retrieved July 4, 2018. ^ "Measuring WTA Tactics With Aggression Score". Heavy Topspin: Tennis Abstract Blog. Retrieved July 4, 2018. ^ "Nonchalant reaction to Wimbledon loss a blessing and curse for Sloane Stephens". ESPN. Retrieved July 6, 2018. ^ "Chris Evert Says Sloane Stephens Lacks Hunger". Tennis Now. Retrieved July 6, 2018. ^ "Chris Evert On Sloane Stephens: 'I Question Whether She Has A Burning Desire'". Forbes. Retrieved July 6, 2018. 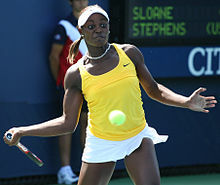 ^ "Sloane Stephens makes late father, stepfather, U.S. tennis proud in U.S. Open girls juniors". New York Daily News. Retrieved July 1, 2018. ^ "Stephens trying to take control of path ahead". espnW. Retrieved July 1, 2018. ^ "Sloane Stephens hires Paul Annacone as her coach". USA Today. Retrieved July 1, 2018. ^ "Stephens Splits With Annacone". WTA Tennis. Retrieved July 1, 2018. ^ "Report: Sloane Stephens working with coach Thomas Hogstedt". Sports Illustrated. Retrieved July 1, 2018. ^ "Nick Saviano To Coach Sloane Stephens; Will Start In Hobart". Tennis.com. Retrieved July 1, 2018. ^ "Sloane Stephens and Nick Saviano Have Parted Ways". Tennis Now. Retrieved July 1, 2018. ^ "Impossible US Open win". WTTW Chicago Tonight. Retrieved July 1, 2018. ^ "Tennis star Sloane Stephens swaps Under Armour for Nike". SportsPro. Retrieved June 28, 2018. ^ "Tennis champion Sloane Stephens, long with Under Armour, signs with Nike". Baltimore Sun. Retrieved June 28, 2018. ^ "Which tennis racquets do the WTA pros use?". Tennis This. Retrieved June 28, 2018. ^ "Friday Tennis Blog: Americans at Miami Open; 2019 Groundbreaking on Football Field". USTA Florida. Retrieved June 28, 2018. ^ "U.S. Tennis Champion Sloane Stephens Takes Center Court In 'BUILT WITH CHOCOLATE MILK'™ Campaign". PR Newswire. Retrieved June 28, 2018. ^ "Sloane Stephens: doTERRA Performance Advocate". doTerra. Retrieved June 28, 2018. ^ "Precision Nutrition Athlete: Sloane Stephens An Inside Look". Precision Nutrition. Retrieved June 28, 2018. ^ "Colgate Bright Smiles, Bright Futures® Educational Program and The Sloane Stephens Foundation Serve Up Smiles to America's Youth". PR Newswire. Retrieved June 28, 2018. ^ "Sloane Stephens, by the Numbers". Wall Street Journal. Retrieved June 28, 2018. ^ "Stephens Named USANA Brand Ambassador". WTA Tennis. Retrieved June 30, 2018. ^ "Tennis Star Sloane Stephens Joins Time Warner Cable to Engage Young People in Math and Science". Market Watch. Retrieved June 28, 2018. ^ "U.S. Open champion Sloane Stephens gives credit to her mom during heartfelt moment". USA Today. Retrieved July 3, 2018. ^ "Caribbean Sports Round-Up – Trinidad-Roots Sloane Stephens Upsets Venus Williams To Claim US Open Finals Spot". News Americas Now. Retrieved June 20, 2018. ^ "Sloane Stephens: My Grandfather". Tennis.com. Retrieved July 3, 2018. ^ "Congratulations pour in for champion Sloane Stephens". Baseline. Retrieved July 4, 2018. ^ "Sloane Stephens 15–01–18 interview". Australian Open. Retrieved July 3, 2018. ^ "Sloane Stephens Foundation". Sloane Stephens Foundation. Retrieved July 3, 2018. ^ "Jozy Altidore, Sloane Stephens make it work as sports power couple". USA Today. Retrieved July 3, 2018. ^ "Sloane Stephens is dating US soccer stud". New York Post. Retrieved July 3, 2018. ^ "Stephens Graduates From Indiana University East". Baseline. Retrieved July 3, 2018. Wikimedia Commons has media related to Sloane Stephens.